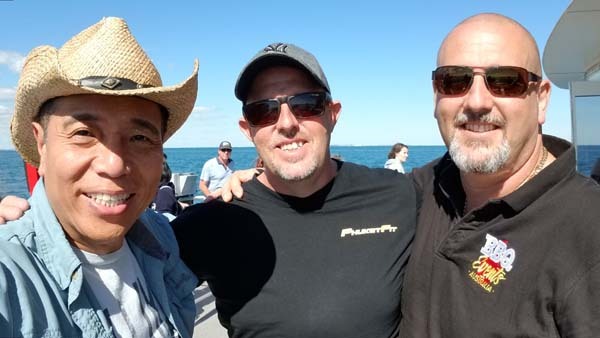 In 2016, I taught three US-style competition barbecue classes in Sydney Australia. 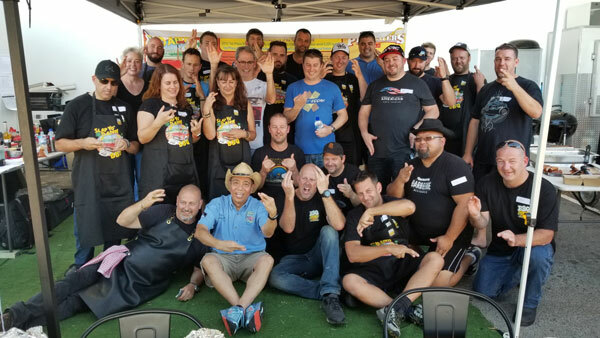 My students have been winning championships using the lessons I taught them and several alumni teams such as Smoking Jokers BBQ of Sydney have won more than half-dozen GCs. Others have taken first place in various meat categories and won GCs. In 2016, Jason Linto from Perth attended my Sydney class. He was a newbie pitmaster then and had purchased his first WSM. Since then, he’s become a full-time BBQ fanatic and a competition pitmaster. 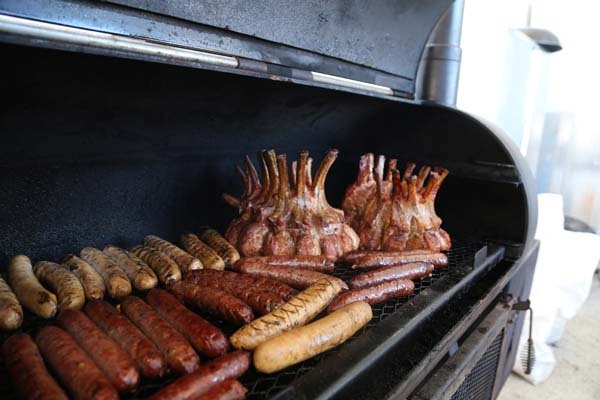 Last year, he created BBQ Events Australia with his business partner Ian McGivern. Together, they promote BBQ contests in Western Australia. The team is Jason, his business partner Ian McGivern, and Justin Fishwick. They compete in contests, organize charity events, cater BBQ, and grill with passion. In 2017, Jason contacted me about teaching classes. Jason had a hunch that my methods would also find an audience. We picked April 2018 for the Perth class. The weather would be nice since it would be fall in the Southern hemisphere. 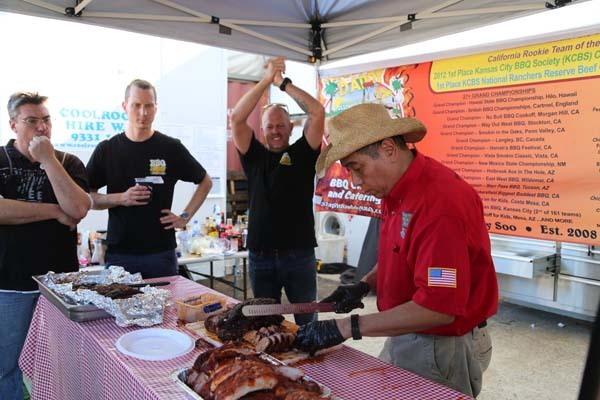 Further, the BBQ comp season would be winding down. Jason and his wife Tricia were very gracious to let me stay with their family in their guest oom. Jason and Ian were like two-birds-of-a-feather. Both of them run successful business enterprises and are passionate about barbecue. 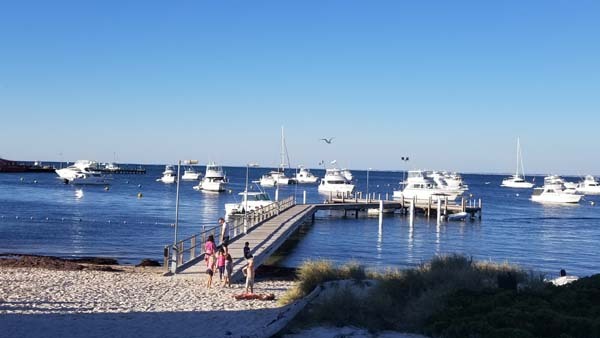 After a day recovery from jet lag, Jason, Ian, and their wives took me for some R&R to Rottnest Island which is a 40-minute catamaran ride from the seaport of Freemantle. We got some exercise, rode bikes, and did selfies with the local marsupials called Quokkas which are only found on this island. 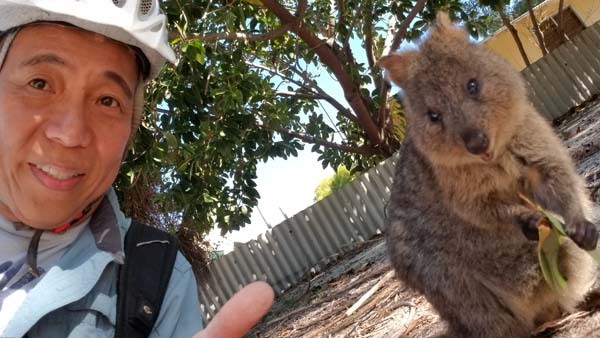 Quokkas became virally-famous after Roger Federer, a tennis player, posted his selfie with them. 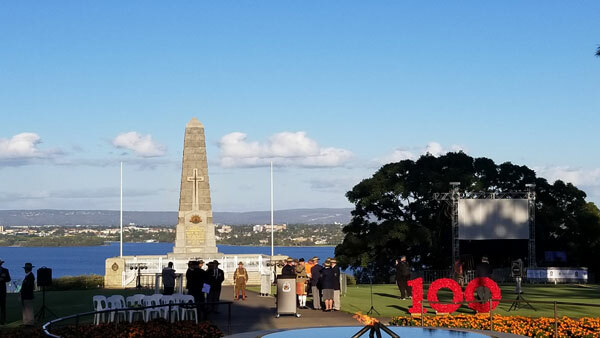 I also was able do some sightseeing around Perth (Kings Park, Chinatown, Swan Valley, Seacroft Quay) and watched ANZAC day which is a military celebration day to honor the fallen military from Australia and New Zealand. Since most in the Aussie barbecue circles knew I cooked 35 items in one of my Sydney classes, Jason and I did not want to short-change folks in Western Australia. Thanks to several sponsors and the abundance of edible creatures, we included Patagonian toothfish (Chilean Seabass), marron (delicious Australian fresh water crawfish the size of small lobsters), crocodile legs, venison, and a wascally rabbit to my already jam-packed regular class menu of 20+ items. The pressure was on also because Lief Huru, the Norwegian-born head chef of Nobu Perth was attending my class. For those who don’t idolize chefs like I do, Nobu Matsuhisa is the Peruvian-born chef of Japanese descent who founded the legendary Nobu in Beverly Hills in 1987 with actor Robert deNiro. 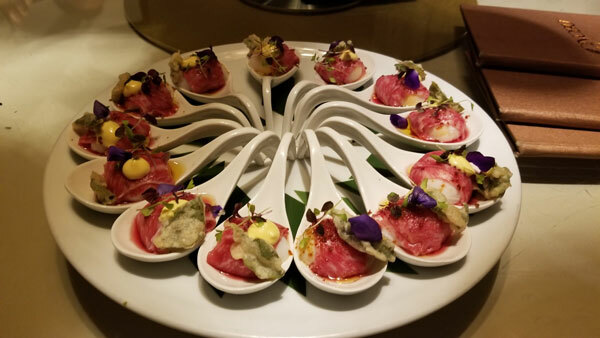 Since I’m a foodie whose life plan is to eat my way through the top 50 restaurants in each state, I made a pilgrimage to Nobu’s in the late 1980’s and was smitten his bold style of marrying Japanese methods with Peruvian seafoods and meats. I bought my first Nobu cookbook and have been a huge fan ever since. Lief, who is a culinary genius and prodigy in his mid-thirties, was handpicked by Nobu as one of the top chefs that he trusted to start new restaurants in faraway places. After Lief’s talent was discovered in Nobu Miami, he was assigned to start up Dubai and then the Bahamas. After those successes, he was assigned to build a flagship restaurant in the 6-star Crown Casino Resort in Perth. Leif met and married Ruby, thanks to match-making by Jason’s business partner Ian McGivern and his wife Claire. Leif and Ruby became new parents of a beautiful girl and decided to make Perth their permanent home. 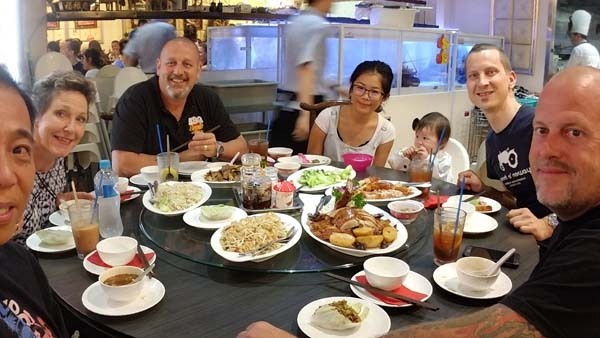 This would no doubt ensure that Leif’s culinary audacity in interpreting Nobu’s style would stay in Perth to the delight of Ian and Claire who are God-Parents to Mia, Leif and Ruby’s one-year old daughter. I was uncertain about what a top Nobu chef would think of my class. 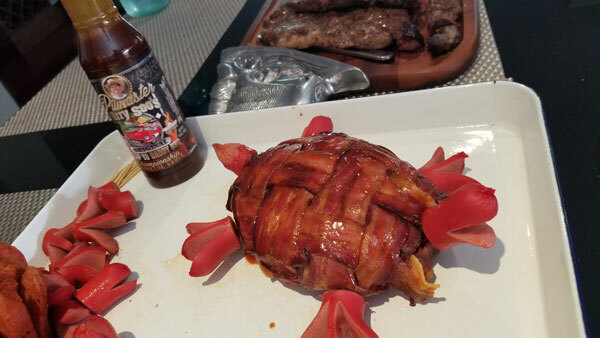 I’m a total quack cooking instructor with no formal culinary school education even though I’ve taught culinary superstars and executive chefs from Four Seasons, Disney, Coast Guard, Famous Dave’s BBQ, Bon Appetite, Flemings Steakhouse, Weber Chicago, major casinos and hotels, cook book authors like Jaime Purviance (Weber cookbook series), and may top ptimasters. My only qualification is my “street” credentials having won 100+ first places and over two dozen GCs. In addition to the items above, Ian (who has done stints as a professional chef and is a construction company owner) and I wanted to take this class over the top with a few pit dishes we came up with including Grilled Marron with Truffle Butter, Rabbit Barbecued and Braised in Porcini Nage, Spicy star anise pit-roasted pig snoots (snout) in soy star anise palm sugar, Tandoori Curry Spatchcock Chicken, and Pit-Braised Dumbo Ears (Pig Ears) in Black Vinegar and Fresh Ginger broth. 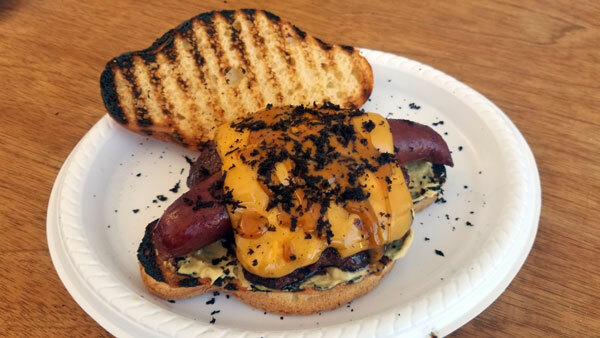 If that was not enough, Gus Gallager, the owner of Perth BBQ School whose teaching location was used for my class, added Vegemite Burger sliders, Million Dollar Ham Dog (hamburger topped with hot dog with shaved black truffles), and Pit Roasted Lamb Shoulder. 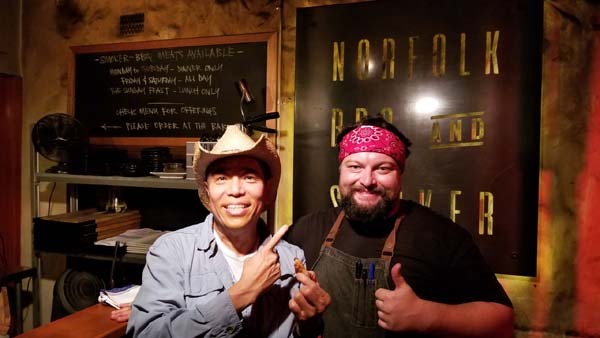 Huge thanks and kudos to Gus Gallager, also my Sydney alumni, for allowing us to use his site and forgoing his cooking school revenue that weekend by letting me use his BBQ school for my class. We didn’t have to worry about impressing Leif because he was a soft spoken, super humble and personal bloke. 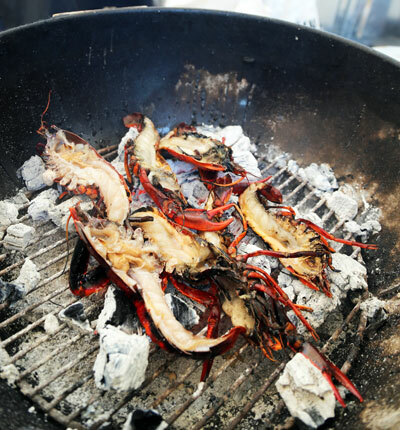 He enjoyed our creations and even sent us some live Marron to cook from his personal inventory. He’s a seafood specialist and he give us some fresh wasabi (grown in Tasmania and exported to Japan) to micro-plane onto the Seared Hamachi Yellowtail with Maui Onion Dressing which I made for class. 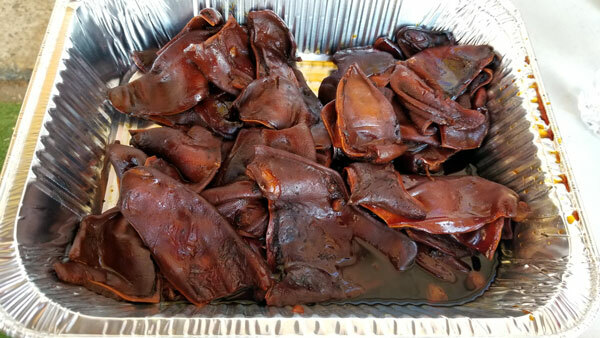 I was super tickled when Leif saved some of the Dumbo and Snoots to take to his chefs at Nobu so they could try the impromptu flavors we created in class. He also asked me for the Hamachi sauce recipe which he liked. Wow! 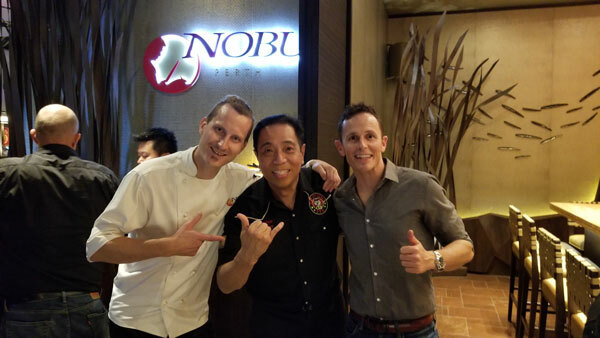 IT nerd pitmaster from Los Angeles shares recipe with top Nobu chef! Also, if I need a table at Nobu Beverly Hills (very hard to get a reservation), Leif said he would contact his counterpart to get me into the chef’s table. If my sweet heart Donna is reading this blog, she will already be calling Leif! To reciprocate, Leif invited us to his Nobu flagship restaurant for dinner the day after class and we had the craziest awesome nuts amazing 40+ course meal which I shared via a Youtube video. Some lucky students also secured their spots to come along for that amazing meal where Leif personally cooked for the 14 of us who dined in the Nobu Restaurant private room. For students who could not make the Saturday or Sunday classes (see video), we held a Thursday meet-and-greet barbecue dinner for 50-guests at the Norfolk Hotel in Freemantle, a port city West of the city of Perth. Justin Fishwich (Jason’s competition team mate) who owns Rib Racks BBQ catering company made the food onsite in his catering rig in the hotel parking lot. Dinner included some of my recipes such the Soy-Vinegar Pork Belly Bites, Pit Roasted Cauliflower with Curry Mayo, Spicy Asian Slaw, and my Umami Brisket. Justin also included his signature Bacon-Crusted Mac-n-Cheese, Corn Wheels, Pickles with Rib Racks Hot Rub. The runaway hit of the night was surprisingly the cauliflower as everyone loved it. Super easy to make with only three ingredients: rub, mayo, curry powder. To speed up the pit roasting part (takes 90 minutes), you can microwave the cauliflower 7 minutes until tender, slather on the curry mayo slurry, and smoke in the pit until the slurry is browned. 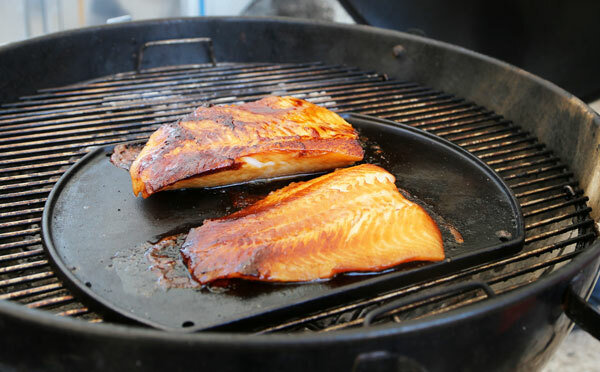 Lickety split ready in 15 minutes in a 350F grill. Ian McGivern, who came from a sausage making family made Pork Fennel Truffle sausages. It was rumored that over $1,000 of black Perigold truffles were shaved into the sausage meat for the 50 jumbo truffle sausages prepared for the dinner guests. 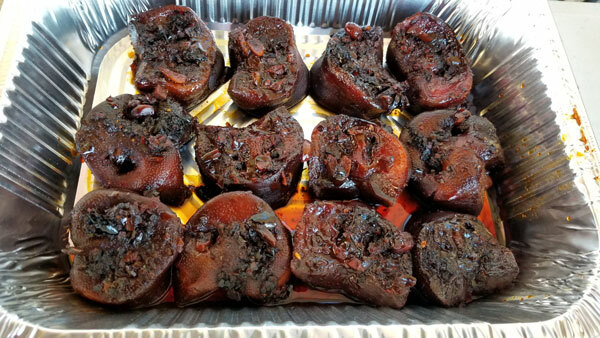 Alex Castiglia, a St. Louis pitmaster, who is a Perth resident and head BBQ pitmaster of Norfolk Hotel provided a delicious smoked berry cobbler dessert. In between all the meat and seafood shopping, meeting with sponsors, chats with the Stonebarn Truffle owner Dion Ranger, setting up pits and gear for class, prepping cooking the meats on Friday night, attending Jason’s $2,000 truffles birthday party with Wagyu and Truffle Sausages at a private cigar club, we found time to conduct a one-on-one Kids Q class for a few kids on Wednesday (see video). 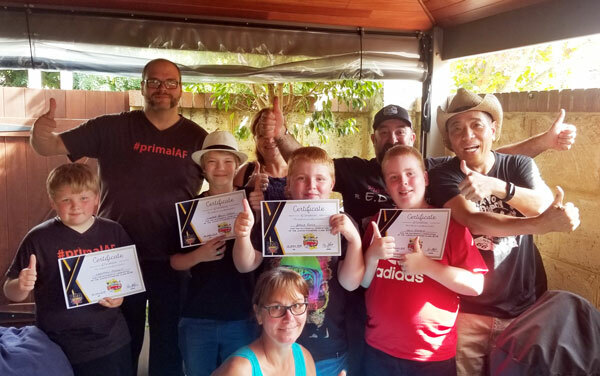 The kids made rubs, seasoned meats, made a bacon weave Turtle Hot Dog Fatties, cooked X-Flip steaks, and each got some Pitmaster certificates to take home. They will no doubt remember the class for a long time. See Kids Que video. 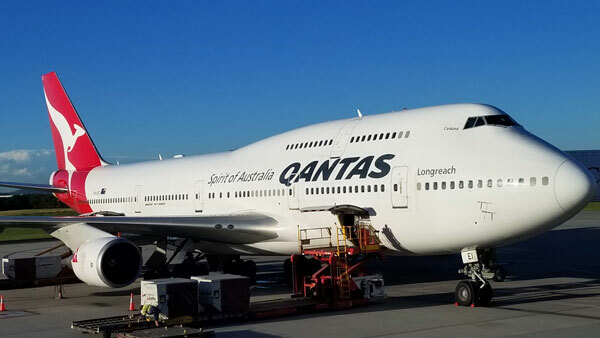 I returned to LA the following Tuesday from my 8-day trip and the online feedback from my Perth students was that they loved the classes. Huge thanks go to Jason, my host, and to Ian, Gus, and Justin. 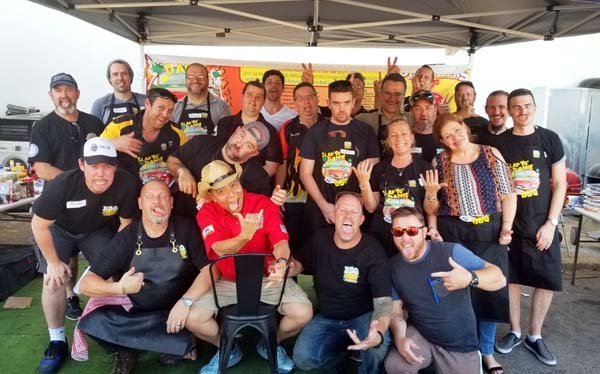 Thank you to all the newly minted Western Australian pitmasters who will now spread BBQ love all over down under. I can’t wait to be back soon. 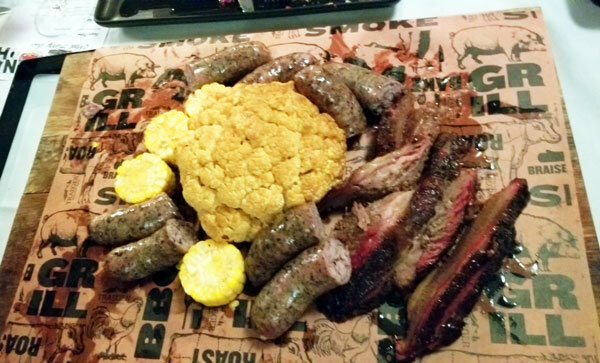 Remember to live, love, and barbecue. See class video. 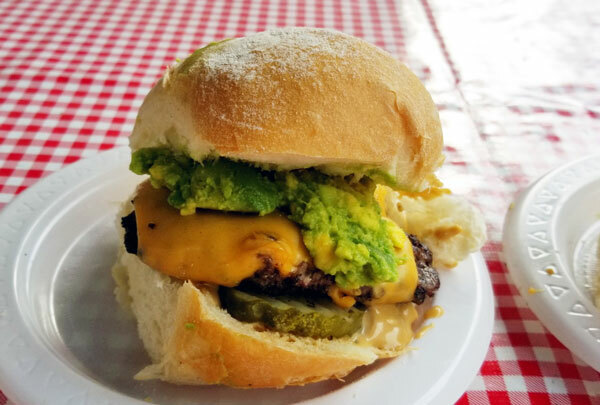 Love to try a Vegamite burger! It’s now on my food bucket list! It was very good. Lots of umami flavors.